Summer has come with bright sunny days and blue sky. Do you have any plans for this summer holiday in Vietnam? 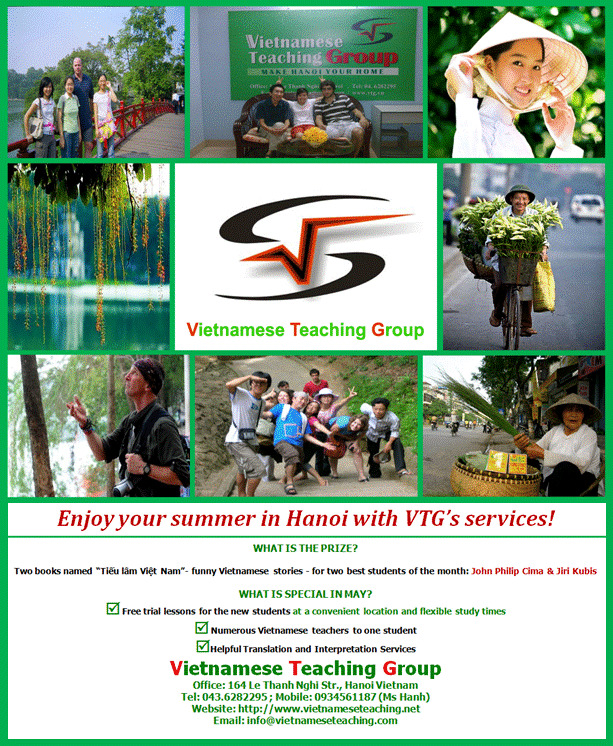 Whether you planned or not, the idea of learning some Vietnamese at VTG and joining our various outdoor activities to get deeper understand Vietnamese land and people might be worth considering for this summer. As usual, this month we are happy to inform you VTG’s upcoming activities for the next months. On June 28th, Hanoiflash – a non-profit organization of Hanoi-Amsterdam school proudly signed a cooperation agreement with Vietnamese Teaching Group. Vietnamese Teaching Group and Hanoiflash both have the desire to present not only Vietnamese culture to foreigners who are living long-term in Hanoi but also share experience to help them live harmoniously in a strange region. Through our activities such as free tour guiding, special exploring Hanoi events, voluntary trips to children villages . Foreign tourists coming to Hanoi at first time? Things seem strange but attractive? Feeling curious but cautious about the hidden charm? Wash all these questions away from your mind. Hanoiflash and Vietnamese Teaching Group are here to help you for free, with young but experienced high school students who are eager to let you know more about our beloved city. Each month, Hanoiflash and Vietnamese Teaching Group will hold a special event for foreigners living in Hanoi in order to help them know more about the city’s beautiful spots. For example, the “Delicious Hanoi traditional dishes” will let you try all the best traditional food in town, or the “Pagodas and Ancient Vietnamese Architecture” will let you have a general understanding the history of Hanoi’s famous pagodas and temples. Voluntary trips to children villages. Sao Mai Village of autistic children and Birla Orphanage are our recent destinations. Here, foreigners can join our volunteers to play with the children and even raise funds for them. Free Vietnamese tests to examine your level. Finding your group to learn Vietnamese: it’s much better to learn a new language with other friends who are at the same level with you.